Newcastle or, rather, Newcastle's Muslim players are in trouble with Wonga's sponsorship of the cash-strapped club. 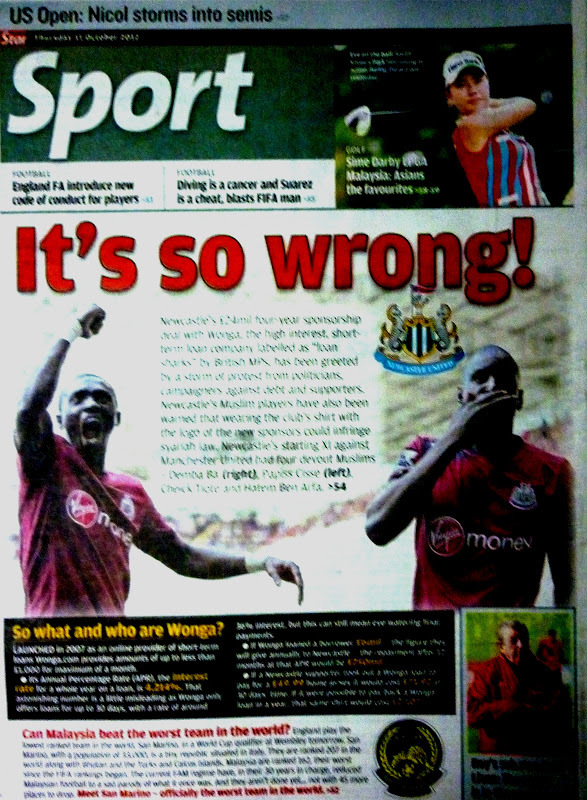 They have been cautioned that wearing the club's jersey with the Wonga logo could infringe syariah law. So who or what is Wonga? Launched in 2007 as an online provider of short-term loans Wonga.com provides amounts of up to no less than £1000 for a maximum of a month. Its Annual Percentage Rate (APR), the interest rate for a whole year on a loan, is 4,214%. That astonishing figure is a little misleading as Wonga only offers loans for up to 30 days, with a rate of around 36% interest, but this can still mean eye-watering final payments. If Wonga loaned a borrower £6mil - the figure they will give annually to Newcastle - the repayment after 12 months at that APR would be £250mil. Wow, if true, that would sound quite familiar to Malaysians. Malaysia's loan sharks or Ah Longs have built up a reputation that Wonga would be proud of themselves if the above is true! Jose Is Right: Arsene Wenger Is A Specialist In Failure! (c) zuqiuwang 2011-2019 All Rights Reserved. Simple theme. Powered by Blogger.